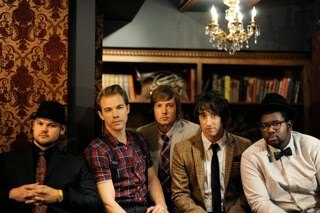 Whilst in the UK for a short, promotional trip, Alter The Press managed to sit down with the Grammy award winning five-piece, Plain White T's for a brief interview. The guys spoke to ATP about: their new album, 'The Wonders Of The Younger', what the band have been up to for the last few years, appearing on Nickelodeon's iCarly and more. Alter The Press: It's been a while since your last UK visit. What have you been up to? Tom Higgenson (vocals): We recorded a new album, put it out, had a big hit in America with it, called '1,2,3,4;' toured a bunch with that album, went back into the studio, recorded another album, and that’s now coming out in October. We've finally made back here, dammit! Dave Tirio (guitars/vocals): Some of the best tours we've ever had, were here. We couldn't get over here with the last album; we tried a bunch of times but were never able to get back, whether it was the timing, label politics or whatever. Our big goal with this album was to get back over here; and here we are now, before the album is even out! Tim Lopez (lead guitar): Also, for the first time in our career, we took some time off which was really nice. Dave: We had a couple of months where we'd do nothing, keep ourselves to ourselves, and wrote songs. ATP: In 2008, you released 'Big Bad World.’ Why do you think that received a lot of negative press? Dave: Some bands don't have 'Hey There Delilah' their entire lives. For us to have it, it totally blind-sighted us. It was a great ride, but we're not going back, you can’t go back; especially into the studio, thinking about it, then you’re fucked. Tom: We just made a cool record, which was just awesome. We just stripped it down, rather then going for some super pop, big success, we went the opposite way, went more of a rock way, and recorded most of it live. Vintage gear, more of a 'rock' sound. That's where we were at the time. I actually love that record. We had big success with, '1, 2, 3, 4', in the US. It nearly got to be as big as 'Delilah,’ like a top 5 song. Dave: It was very necessary, in the line of what’s to come; but, in addition to that, we've never been a ‘critic’ band, and don't really care what they think. Tom, Tim and Dave: It's about the fans. ATP: After hearing the new single, 'Rhythm Of Love', the band appear to have gone in a different direction from the classic Plain White T's sound; Tim is now singing and Tom is doing harmonies. What made you go in this direction? Tom: The song was written and Tim sounded great singing it. I tried singing it in the studio, but Tim sounded more sincere. He wrote it, it's about a real life experience for him, so he ended up singing. With this album, we are taking a lot of risks and a lot of chances, trying to step out of the box, outside of our comfort zone. What better way to do that, then have Tim sing a damn song. ATP: Is this an indication of how the new album will sound? Tom: Yeah, in the sense of, it's exciting, and you don't know what to expect next. Tim: We wanted it to feel like, you are being taken on a bit of a journey, take you away from reality for a while. Dave: It’s what goes with the title of the record, 'The Wonders Of The Younger'. Tim: This isn't your average album. The lead singer isn't even singing on the single. We wanted to be different, to be creative and artistic. ATP: How would you describe 'The Wonders Of The Younger' in comparison to previous material? Tom: There’s definitely a bigger scope to the record; the production, going from the last album, which was more raw, strict, this one is the complete opposite. This one we went big scale, big thick production, moody, vibey and atmospheric. The songs are still very catchy and very sincere, and "sing-a-long-able". The theme and mood behind it sets it apart. ATP: Your music has been used in various TV shows, but the coolest thing you've appeared in, has been iCarly (Nickelodeon show). What was it like, to be on the show? Tom: That was cool. That show was never on before we shot it. We shot it before the pilot even aired. The reason why we were stoked for it was because it was the girl from School Of Rock (Miranda Cosgrove) and it turned out to be a super cool, funny, show. We lucked out with that. Dave: It's kind of crazy. Tom: We were written into the script of ‘Spencer saved my life in the mall.’ I actually ran into Jennette (McCurdy, actress on the show) in the mall in Nashville, and had a little iCarly reunion. ATP: What's the plan next for the Plain White T's? Tom: For now, we are going to be setting up this record. We are going to be doing a lot of promo, going around the world. We are going to Germany in a couple weeks, back here to do a show, more stuff in America and then doing more stuff to set everything up. The album is out October 18th; then we start touring. Tim: We are trying to come back here by the end of the year, possibly November, for a proper tour. Tom: I'm sure we'll be back next year for all the festivals; things like that. ATP: No US tour in the works? Dave: US tour is looking more like a December thing. Tom: We're trying to come to the UK in November; US in December, and then January, February start fresh. ATP: You've just released, 'Rhythm Of Love' as the first single; any ideas on the second yet? Dave: Even before we went into the studio. Tom: We performed it on our last tour, with Snow Patrol, in America. We played it on that tour. We're hoping for that as the next single. ATP: Thanks for your time. Anything else you would like to add? Tim: Just that we're looking forward to being back. Tom: We are going to spoil the UK this time. We'll be here so much. 'The Wonders Of The Younger' is out October 18th.